From the time he was in fifth grade, Ed Emory knew what he wanted to do with his life. Perhaps it was because of the patience and understanding of a coach he had in middle school. Or maybe it was something that his mother Eunice instilled in him. Or, maybe it was because at a young age with a speech impediment, Emory saw that people need a little help sometimes in the form of encouragement. Perhaps it was a little of each those influences that led Emory, as a fifth grader, to decide that he wanted to be a football coach and an educator. He has dedicated a lifetime to both and is, today, doing the very thing he dreamed of at such a young age. In his life, Emory has done just what he dreamed. After a stellar collegiate career as a player at East Carolina under Coach Jack Boone, Emory went right into high school coaching. He followed that by moving on to the college ranks, eventually landing his dream job as the top coach at ECU. And now, at age 65, Emory is the skipper of one of the premier high school programs in North Carolina in Richmond Senior High School. Emory believes in a lot of things and one of them is what he calls, ‘Want Power.’ Want Power is that powerful inner drive that propels people to achieve those things they want most. Emory has always had that Want Power and it bubbled to the surface early for him. “I went to Camden Military Academy (a small school in Camden, SC) and we went undefeated,” Emory said. “Every time I’d come home, there were these two ECU boys who kept coming around the service station — George Tucker, who later coached Wingate and Elon, and Paul Gay. They would come around and were always talking about ECU. Having played three years at a military prep school had Emory, a tenacious offensive lineman, miles ahead of the other freshmen already. That being the case, Emory came in and started on the varsity for four years, though it wasn’t easy the whole time. It would have been very easy for Emory to pack it in, but it wasn’t in his nature to give up. His Want Power was too strong. At the time Emory was a Pirate player, his older brother was playing at Wingate and his younger brother, Melvin, was destined to play at Clemson. The fourth Emory boy, Maurice, never played college ball as he bypassed college to run the family grocery business after their father died. Maurice did end up playing some semi-pro ball down in South Carolina. Emory recovered from his freshman season injury and continued to play for the Pirates, letting no obstacle stand in his way. But Emory did finish school and then some. He finished an undergraduate degree and most of his Masters’ program in his four years as a player. His first foray into coaching wasn’t very memorable. Thompson, however, was not an off-season kind of coach. After the season, he would hit the road and not think of football again until just before the next season began. This mindset didn’t fit with Emory, who was possessed by football. 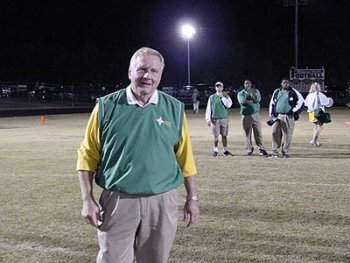 With success, of course, came opportunities and Emory – with his Masters in hand – headed for greener pastures, in the form of a head coaching position at Wadesboro. Of course, in a little bit of foreshadowing, Emory got a taste of having high aspirations with a very low budget. Emory had finally established Wadesboro as a power program when the federal government mandated the integration of schools. For Anson, which already enjoyed an integrated football team, the combining of six black schools and three whites schools in 1967, meant that nothing would ever be the same. “The new school was Bowman High School,” Emory said. “I became the head coach and athletic director. We already had the best football players, black and white, coming to the school, so we didn’t gain that much (in the integration). But when they returned, the problems began to show in the form of the Ku Klux Klan. The problems were widespread enough to lead a reporter from Sports Illustrated to investigate, eventually leading to a feature story with Ed Emory’s take on the Klan and its impact on prep teams. “I knew there was a problem when I went into the locker room on Monday and all my black players were in there,” he said. “They said, ‘Coach, can we talk to you?’ So, then went on to tell me that they didn’t believe it was right that since they are on the same team with their white teammates, that they shouldn’t have to get ready for practice alongside members of the Ku Klux Klan. I told them I didn’t think that was right either. But the problem didn’t go away. A white player, dressed in a Klansman’s guard uniform, rode his motorcycle through a black neighborhood, stirring things up. Then, a week later, Emory got a visit he will not soon forget. “I noticed about 45 guys watching our practice one day,” Emory said. “I knew that the school used the fieldhouse sometimes for night school, so at first, I though that’s what they were there for… adult school. They said they wanted to speak to me, but I never speak to anyone during practice except my players and coaches. Then I realized what it was and told them I would talk after practice. When practice ended, I asked the other coaches to get up to the field house (for backup). When I got up there, a guy came over and I noticed from his nametag from work, that he was the father of one of my players, actually two of them. He says that I am violating his sons’ constitutional rights by telling them that they cannot join the Klan. At the time, the Klan had blown up some buildings there, including a cabin belonging to the superintendent. Emory’s wife, Nancy Buie Emory, had packed up and headed out of town to stay with her mother, fearing that their house would soon be firebombed. It was a scary time to be blind to color. It even drew the attention of a writer with the Raleigh News & Observer. But for Emory, the incident only served to fuel his resolve. It was against his nature to turn from a fight, a trait going back to the days when Emory had to deal with ridicule every day due to a speech impediment. As the story went, the reporter’s story made the rounds, frequently quoting Emory’s statement that his football program was a dictatorship, not a Democracy. The man who was upset with Emory had a son named Vernon who was a blue-chip middle linebacker on Emory’s squad. He had another son, nicknamed Fireball, who was playing junior varsity ball. Fireball, or Charles as he was named, used to repeatedly steal the shirt of a black player, whose name was Sylvester. Sylvester, who would go on to become a professional wrestler called the Junkyard Dog, was a mild-mannered kid but could only take so much, so he told Emory. When Emory confronted Fireball, the player ran down the street and came back with his father in tow. It was a second visit for the two men. Emory told his boss he would write a letter of resignation, and Emory’s wife headed back to her mom’s house fearing retribution. The boys’ mother eventually called to apologize for her husband, but Vernon still missed the game. The team won and for the record, had a stalwart game without Vernon. Emory didn’t need to resign and eventually the boys came back to the team – out of Want Power – and there was no more trouble. Fireball, sadly, did end up going to jail, and Vernon died just a few years ago having had a long, close relationship with Emory. Having proven himself impeccably at the high school level, Emory was ready to make a move on his dream of becoming the head coach at East Carolina University. “In February of 1967, I went to Wake Forest for my first collegiate job,” Emory said. “I had always wanted to be at ECU, and when Coach Stas (Clarence Stasavich) gave a speech two years to my team, I was very excited. Stas did offer him a job but it only paid $6,000, when Wake was paying $10,500. Plus, ECU, at the time, didn’t hire assistants with the idea of them eventually becoming head coach. At Wake, he was named the head junior varsity coach, but it lasted less than a year. After turning down Marshall, Emory chose to head to Brevard as AD and coach. In 1973, Emory found himself headed for Clemson to coach for Red Parker. At Clemson, he spent three years as the running backs coach and a year as the offensive line coach. “Clemson was a great place to coach,” Emory said. “People always said that Clemson couldn’t recruit out of South Carolina. But there was Want Power at Clemson. They wanted it badly at Clemson. I made a statement that in the next three to five seasons Clemson would win a national championship. And, of course, they did. I always thought that East Carolina could do the same. After traveling from Clemson to Duke to Georgia Tech, East Carolina came calling. Though ECU called, it was not like Emory was a stranger. He had applied for and received an invitation to be interviewed for the position. He and Jim Donnan both first applied for the job following Mike McGee’s departure for Duke after the 1970 season. Then the same group interviewed after Sonny Randle resigned. 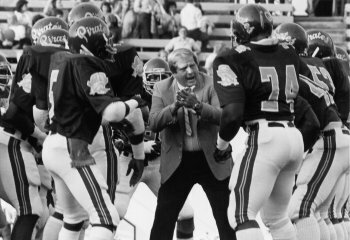 The third time, after Pat Dye headed to Wyoming, was the charm for Emory, beating out Donnan for the position. For Emory, it was the destination he knew he would someday reach. “I was so happy,” Emory said. “I had kind of wished that Leo (Jenkins) was still there because I would have liked to have worked for him. I always thought I would die (at ECU). I worked at being a better coach, a better recruiter, a better people person. I had all of those philosophies. I had spent 24 hours a day, seven days a week, for 34 years, to get (to ECU). After inheriting a Pat Dye program had been successful on the field but was wrought with what Emory called “big problems” off the field, Emory set out to achieve his dream, many times funding his own travel expeditions and other expenses to recruit players. 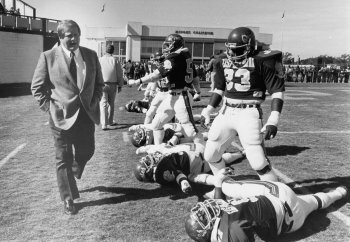 With a recruiting budget that, according to Emory, had been virtually depleted to zero to pay other athletic department expenses, he and his assistants went out and shook the trees to find a host of 1980 signees that would eventually be the team that would shake up the college football world four seasons later. After struggling for two years, the program began to take shape in 1982. That team went 7-4 and served as a solid indicator of what was to follow, when the Pirates went 8-3, with losses against Florida State, Miami, and Florida by a combined total of 13 points. The 1983 team, loaded with what would turn out to be a bunch of professional players, served as a beacon, putting ECU on the national stage for the first time forever marking ECU’s real introduction into big-time football. An unfortunate disagreement with then-athletic director Dr. Kenneth Karr, led to the dismissal of Emory after the 1984 season. The lingering affects of the firing still haunt Emory. Down, distraught, Emory was drowning in the pain in the wake of his firing. Fortunately, Pepper Rogers called him and asked him to come down to Memphis to join his staff for the USFL’s Memphis Showboats. Emory’s contributions to ECU football should not be lost on the former coach. He was the coach who ushered ECU into the uppermost ranges of big-time college football. His 1983 squad was arguably the most talent-packed Pirate team ever assembled, and it gained the first burning glare of national recognition for the young program. He was and forever shall be a big piece of East Carolina history. Today, Emory is still the wily coach he always was. He is entering his second year as the varsity head coach at Richmond Senior, where football is taken very seriously. “I remember last season, a guy came up to me during practice and said, ‘My name is Bubba,’” Emory said. Such is Richmond football, but Emory loves it, every bit of it. In addition to his head coaching duties, Emory is a drug educator at Richmond. With ECU’s signing this season of Richmond standout Eric Terry, Emory once again has a direct connection with his beloved alma mater. “I’m proud, real proud of Eric,” he said. “I told him he could go any place he wants to play football, but if he was asking me, I say go to ECU. As for Emory’s reflections on his ECU days? And he’s still blessed. He still has good kids and is healthy enough to coach them, which is all he ever really wanted in the first place. At 65, the game and desire to coach are just as fresh as they were back when he was in fifth grade and the dream was first taking shape.